Next time you are looking to spice things up in the bedroom, try out this tantalising game. 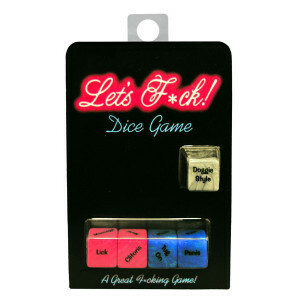 All you need are these glow in the dark dice to ignite the spark. One dice features six actions, such as lick or kiss, while the other features six body parts. Roll both dice and follow their lead for a night of passion neither of you will forget. Random combinations of the glowing dice faces suggest a number of night time activities for you to try. Fun if you're in the mood for a giggle in the dark, if that's how you roll. These love dice are great to use in a candle lit room with your partner or if you're feeling like a bit of a thrill you can try using them in complete darkness. Can be fun to get foreplay starter but does get repetitive.